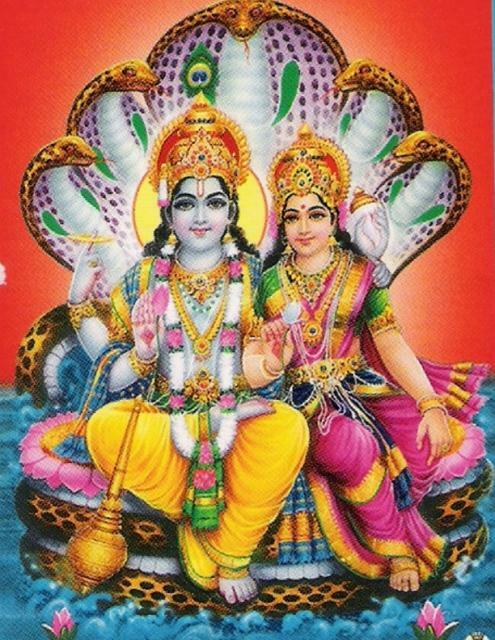 In this Part we will explore the meaning of the Sixth Shloka of Sri Vishnu Sahasranamam. The Lord is immeasurable and undefinable; he is the controller of all Indriyas, and he sustains the Universe, and HE is the Lord of all the Devas. He has chiseled and Created the world, all caused just by His thinking alone; He is changeless and remains whole through time and space; and is ageless who is not impacted by the Kaal Chakra. direct perception through the senses namely by seeing, hearing, tasting, smelling or touching. This is called ‘Pratyaksha’. inference from an associated object. For example smoke is always associated with fire. So the presence of smoke leads one to conclude there must be fire in the vicinity. This is called ‘Anumaana’. example or analogy. An unknown object is defined by citing examples using known objects. This is called ‘Upamana’. written or verbal description from an authoritative source. This is called ‘Shabda Pramaanam’. Now defining the Bhagavan by direct perception (Pratyaksha) is not possible because he is beyond the reach of our sense organs. As Katha Upanishad puts it ‘Ashabdam Asparsham Aroopam Avyayam tathaa Arasam Nityam Agandhavat cha yat – That which is without sound, without touch, without form, without decay, without taste, without smell, without beginning and without end’. Such an entity is clearly beyond the comprehension of our sense organs. He cannot be explained by inference (Anumaaana) because he is devoid of the associated objects leading to inference. He is unique and without connections. He cannot be explained by citing examples or analogies (Upamana) because there is nothing to compare Him with. He is Infinite and everything else is finite and so comparison with anything else is ruled out. Thirumangai Azhwar said “நான் மறைகள் தேடி என்றும் காணமாட்டா செல்வன் – Naan maraigal thedi endrum kaanamaatta Selvan”. Meaning: Having read the four vedas, the Lord’s limitless wealth is indescribable. Thirumal udaiya nabhi ileye thamarai poovil irundha podhilum, Brahma andha Thirumalai ariya mattaar. Avar ella vatrirkum appar pattavar”. Meaning: Even Brahma who is seated on the lotus emanating from Lord’s navel will not know everything about the Lord. This Nama can be interpreted in 2 ways. a) Hrisheeka means sense organs and Eesha means Lord, so Hrisheekesha means the Lord of the sense organs or the Power by which the sense organs function in the way they do. The five gnanedriyas (Eyes – Seeing, Ears – Hearing, Nose – Smell, Mouth – Speech and Skin – Touch) and five Karmendriyas (Hands, Legs, Tongue, Excretion and Reproductive organs) are under the Lord’s control. b) Hrisheekeshah can be split as Hrishee + Keshah. In this interpretation Hrishee means something that gives happiness and Kesha means rays. In other words Bhagavan is radiating rays of happiness in the form of Sun and the Moon. Padma means Lotus and Naabhi means navel so Padmanaabha is someone who has a Lotus in his navel. As Sri Adi Sankara puts it, it’s not an ordinary Lotus, but ‘Sarvajagat Kaaranam Padmam – the underlying Cause for all Creation being the seat of Brahma the Creator’. The Lotus denotes the Kaal Chakra or Cycle of the Yugas. There are 7 nether worlds and seven upper regions including the Earth. 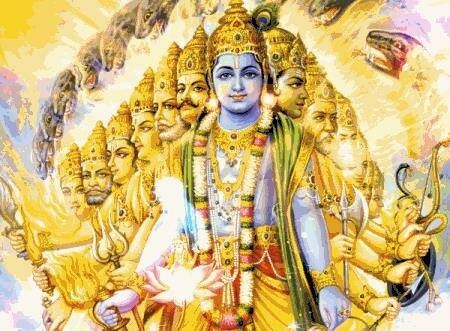 The Bhagavata Puranas calls the seven lower regions bila-svargas (“subterranean heavens”) and these are – Atalam, Vitalam, Nitalam, Rasatalam, Mahatalam, Sutalam and Patalam. These 14 worlds make up the Cosmos and also referred as Brahmaanda or Anda. It’s referred as Hiranygarbha (in Rig Veda 10.121) meaning the Golden Foetus. The Upanishads elaborate that the Hiranyagarbha floated around in emptiness for a while, and then exploded, something that the Big Bang theory also explains as the beginning of the Cosmos. According to the Vedas and Upanishads, there are several millions of such Andas and the Lord sustains them all. Sri Radhakrishna Sastri gives a beautiful and simple explanation to enable the appreciation of this Nama. In our normal life, the baby is connected to the mother before birth and at the time of birth through the umbilical cord through which it gets nourishment from the mother. Similarly, the cord from the Lord’s navel is nothing but the Universe in its primordial form which looks like a Lotus that has not bloomed. This is prior to its full bloom through Time and He is the nourisher of his Creation i.e. Brahma. A related story here is that of how Shiva’s curse as a result of his act of plucking one of Brahma’s five heads was relieved by Lord Narayana. Lord Shiva acquired BrahmaHatya Dosham by plucking one of the five heads of Brahma. Brahma’s curse for that act resulted in the skull getting stuck to his hand and Shiva was forced to seek alms with that skull in hand. He cursed such that he can get rid of his sin only if the Kabaalam is completely filled-up with food. Shiva went around the world on a pilgrimage to find salvation from the curse by begging for food with Brahma’s skull as the begging bowl. Every time someone filled the vessel with food, it vanished immediately, to Shiva’s horror. Finally, Shiva reached Goddess Lakshmi and appealed to her. She filled the vessel with food ending Shiva’s hunger. However, to Shiva’s dismay, Brahma’s skull still lay fixed on his hand. Shiva did penance and offered His worship to Sriman Narayana. 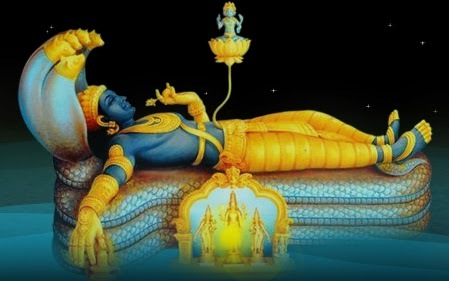 Vishnu answered Shiva’s prayer for salvation and asked him to bathe at Kandiyur Pushkarini. Shiva took a dip in the Pushkarini and with the Lord Kamalanathan’s blessing, the kapalam detached itself from his hand. As a result, the Bhagavan, at this temple, is known as Hara Saapa Vimochana Perumal and the Pushkarini is recognized as Kapaala Thirtham. Hara is another name for Shiva. Mangalasasanam: Thirumangai Azhwar has sung about this in one of his Pasurams (Divya Prabhandam 2050) in Thirukkuruntaandagam (19). Meaning: This is the place (Kandiyur) renowned for having rid Lord Shiva of his curse which was incurred as a result of his having plucked one of Brahma’s heads. Lord Shiva went around (with the skull of Brahma which stuck to his hand) begging for his food. His hunger got quenched finally and his curse was lifted at Kandiyur. The Lord of Kandiyur is the one who dwells in Srirangam, Thirumeyyam, Kanchipuram, Thiruppernagar, and Thirukkadalmallai. The Kandiyur temple is known as Hara Saapa Vimochana Perumal Temple and is no 7 of the 108 Divya Desams. Temple Details: Kandiyur is located at 7 km from Thanjavur on the Thanjavur—Thiruvaiyaaru route on the banks of the river Kudamurutti (a tributary of the Kaveri river). The presiding deity at this shrine is called Harasaapa Vimochana PerumaL (one who relieved the curse of Haran) in a standing posture facing the easterly direction. The goddess goes by the name Kamalavalli. The festival idol has the name Kamalanathan. The crown structure over the sanctum is called Kamalakruti Vimanam. The temple pond goes by the names – Kapala Moksha Theertham, Bhali Theertham, and Padma Theertham. Amara means the Devas or the demigods such as Agni (Fire), Varuna (Water) and Vayu (Wind). Prabhu means the Lord. Amaraprabhu therefore means the Lord of the Devas. The Lord is Amaraprabhu because He created the different Devas and entrusted them with functional identities such as wind, fire, water etc. He made them immortal because of their functions and directs them in their functions. a) The Creator of the Universe. b) One whose act is the Universe. c) Somebody who possesses wonderful powers of Creation. d) The power behind the celestial architect of the same name. Sri Parasara Bhattar points out that this Nama signifies that the entire affairs of the Universe are His alone both before and after the Creation of Brahma. In other words, He is the Director and Controller of the Universe. Manuh means the great thinker. ‘Mananaat Manuh – He is called Manuh because of his Mananam, the great faculty of thinking’. Brihadaaranyaka Upanishad says ‘Naanyoto asti Mantaa – There is no thinker but Him’. To mentally visualise an act prior to the act itself is mananam. Bhagavan has to just think in order to achieve what He wills. The Creation of the Cosmos was only a minute part of His Will. Sri Bhattar uses the word sankalpa lava maatraat – by the tiniest fraction of His will, to explain this. 1. The Name of a Mantra. 2. The first human on the earth from whom all others descended. This Nama is derived from the root word ‘tvaksh – to pare, to reduce, to chisel’. Sri Adi Sankara interprets this Nama to indicate that Bhagavan pares down all beings and makes them shrink at the time of Cosmic dissolution or Pralaya. Sri Parasara Bhattar uses this meaning to interpret this Nama to mean that Bhagavan has “chiseled” so many diverse forms, Devas, man, birds, plants, insects, etc., and thus He is Tvashtaa. 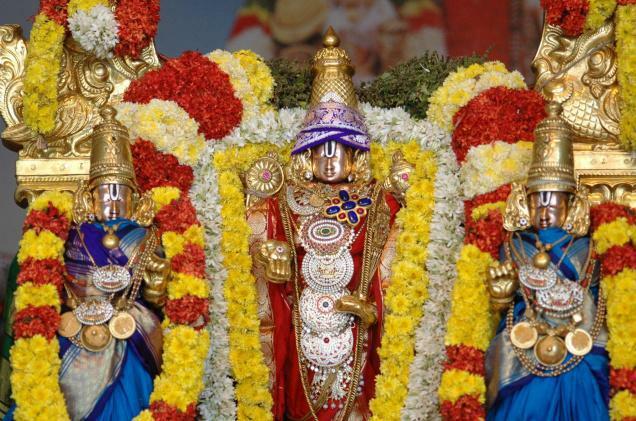 He gives the Taittriya Aaranyaka (3-11) in support of his interpretation – ‘tvashtaaram roopaani vikurvantam vipaschitam – the One who moulds multifarious forms and diverse objects’. This Nama is derived from the two words sthoola and ishtha – One who willed Himself to be huge when needed (as in Trivikrama Avatar). Sri Parasara Bhattar points out that this huge size is the manifestation of Bhagavan as the Brahmaandaa (the egg-shaped Universe) with the fourteen worlds, which are the places of residences for all the beings that He has Created. Sthavirah means most ancient or older than the oldest. It means that Bhagavan while causing the Universe to exist for millions of years is Himself timeless, ageless and changeless. 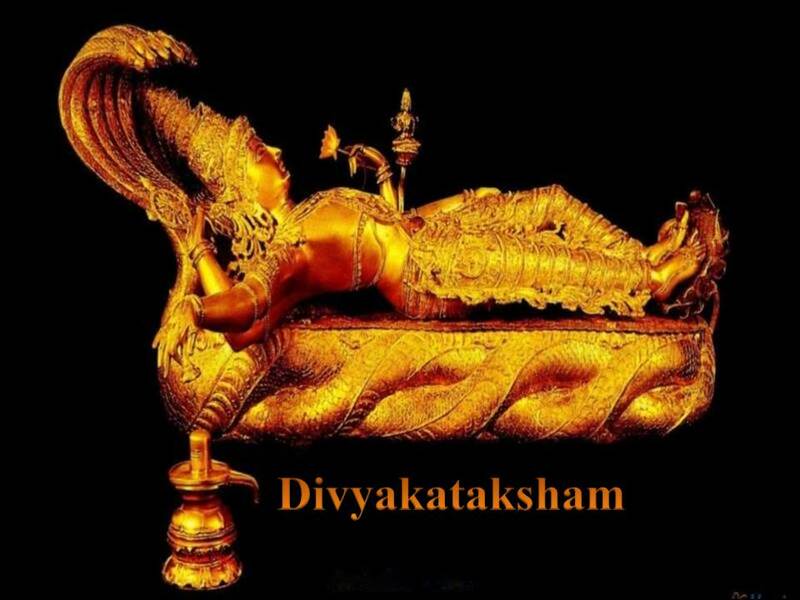 Sri Adi Sankara takes Sthaviro Dhruvaha as a composite word – ‘Savisheshanam ekam naamam – a single Nama with a built in adjective’. Sri Parasara Bhattar takes them as two separate Namas, one denoting fixed in time and the other denoting fixed in space. The composite meaning is the same for both the commentators. Dhruvah means fixed, stable and unmoving. Even after creating so many lives, things and objects, Bhagavan remains whole, stable and unchanged. While the clay may become pot and change its form, Bhagavan remains the same even after using his energy for all his Creations. There is not even a slightest depreciation in his form. Bhagavan is Immeasurable, undefinable and cannot be realised by the five senses, hence He is Apremeyah. He is Hrisheekeshah as He is the Master of all Senses. He is the underlying Cause for all Creation being the seat of Brahma the Creator. He is Padmanaabhah as Padma (Universe) emanates from his Naabhi (navel) sustained by something like an umbilical cord. HE is the Lord of all the Devas and hence Amaraprabhuh. He has chiseled and Created the world like Vishvakarmaa does with his tools. He is Manah as He caused the Creation by His thinking alone; He is called Tvashtaa as He shrinks the World during Pralaya and subsumes it within Him. He is Sthavistha as He assumes gigantic forms at His Will (like the huge Boar in Varaha Avatar or Trivikrama in Vamana Avatar). He is Sthavirah as He is older than the oldest. He is changeless and remains whole through time and space. He is ageless who is not impacted by the Kaal Chakra and eternal; hence He is called Dhruvah. . The Vishnu Sahasranamam series is authoried with the help of my friend Shri Balaji. As far my knowledge goes “Naanmarai” refers to Chaturvedas only.Splitting it to “Naan” meaning “I’ and “Marai” does not seem appropriate. As Shri Sridhar admitted writing “Naanmaraii” instead of “Naanilam” appears to be over sight. Also Shri.Balaji refers to seven.lokas above and seven lokas below the earthin this sloka.. Very interesting instead! In a way your original interpretation is also correct if you take Naan in the meaning of ‘I’ in Tamil. I think it is a pun between Four and I since in Tamil ‘Naan’ has both these meanings! நான்மறைகள்தேடிஎன்றும்காணமாட்டாசெல்வன் – Naan maraigal thedi endrum kaanamaatta Selvan”. Meaning: Even after I search the whole world nothing will compare to being with the Lord which is equal to limitless wealth. Maraigal : refers to Chatur Vedas. Is it not? Please explain. Kala is undefinable yet we denote the Past and the Future w.r.t. the Present which we discern moment by moment(far less than nano seconds).Any more comments! Thank you for your comments. You are absolutely right in your observation that Naan Maraigal would refer to the four vedas. Naanilamum would refer to the four worlds of The Earth, the worlds above Earth, the worlds below Earth and the Eternal world. It’s my oversight that I linked the world ‘Thedi’ to the search the four worlds….I have amended it to reflect this. Thank you. Divine narration.. Overwhelmed while pondering at many points… Thanq sooo much.